After a failed attempt at baseball, (I think it was the bat) I decided all I wanted to do was play music for a living. I currently play 2nd trombone with the Minneapolis Pops and occasionally slide over to third, to fill in on bass trombone. 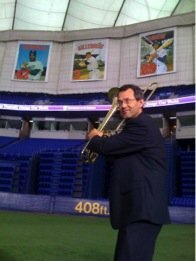 As a “utility infielder” I’ve had the opportunity to perform with many different twin cities teams, including the Minnesota Opera, St. Paul Chamber Orchestra, and the Minnesota Orchestra (still waiting for a call from Gardy). Unfortunately utility infielders don’t make the big bucks, so I have pursued the highly lucrative profession of college adjunct teaching (Senior Lecturer at the University of Wisconsin-River Falls and instructor of trombone at Macalester College). What do I do in my spare time? Well, after raising four children, my wife Patti and I finally have spare time. We love to hike. My favorites over the years are hiking to the top of Longs Peak in northern Colorado, (14,259 feet) and hiking to the bottom of the Grand Canyon. And, of course, we love walking around Lake Harriet.